The following interview was recently granted by His Eminence, Metropolitan Hilarion (Alfeyev) of Volokolamsk, chairman of the Department for External Church Relations of the Moscow Patriarchate, to the newspaper Kommersant. In it, he touches upon many pressing questions: the relationship between the Russian Orthodox Church and Russian politics and society; relations between the Russian Church and the Roman Catholic Church and the possibility of a meeting between the Patriarch of Moscow and the Pope of Rome; questions of canonical territory; the financial affairs of the Moscow Patriarchate; and many other topical concerns. Throughout, His Eminence corrects many misconceptions that are frequently repeated in the media. As this interview is quite extensive, the first half is posted below, and the second half will appear here next week. Question: What, in your opinion, is the position of the Russian Orthodox Church in contemporary Russian society? Metropolitan Hilarion: I think that the Church occupies its rightful place in Russian society. Over the course of seventy years, the Church was artificially isolated from society; but after it left the catacombs in 1988, it became evident, despite seventy years of persecution, that it possesses enormous authority, that it is in demand, and that people await its return to public life. It is from this point that the Church’s revival is taking place. It is taking place at a rate that is unprecedented in the history of Christianity. It might be compared with the period following the Edict of Milan, when churches began to be constructed everywhere within the Roman Empire, both in the East and in the West. We do not have statistics from that period. But we do have modern statistics. And they are very impressive. Twenty-five thousand churches have been built and renovated in twenty-five years. This means that one thousand churches were opened a year, three churches a day. Eight hundred new monasteries. This phenomenon is unparalleled in church history, at least in recent history. Question: The Church is now often criticized for being too closely linked with the government. The higher clergy are accused of confluence with the secular powers. How do you regard such criticism? Metropolitan Hilarion: I think that this criticism is unfounded and unjust. We all live in one country; no one is forbidden to communicate with one another. A large variety of people come to my office with a large variety of issues and questions. These are both representatives of different religious traditions and other Christian confessions, as well as representatives of the government – and not just of Russia. It is perfectly natural for the Church to build a relationship with the government. Our Church is multi-national. Its canonical territory incorporates fifteen governments, not to mention the fact that we have dioceses and parishes outside the boundaries of our canonical territory. In each of these countries, the Patriarch establishes contact with top governmental officials: in Russia, it is President Vladimir Putin; in Ukraine, it is President Viktor Yanukovych; in Belarus, it is President Alexander Lukashenko, and so on. When the Patriarch visits a given country, he meets with the head of state. And this is not because the Church is coalescing with the government, but because the Church is establishing partner relationships with the government. These relationships are based on two principles. The first principle is mutual non-interference of the Church and government in the internal affairs of each. The second principle is the cooperation of the Church and government in areas in which such cooperation is useful and necessary. The defense of traditional family values is just one such area in which the Church and government can work together without any kind of coalescence or interference in each other’s affairs. Question: Does it turn out that the relationship of the Moscow Patriarchate to the Kremlin is only one of cooperation? Metropolitan Hilarion: Yes, this is a cooperative relationship, with joint projects on many topics – for instance, in the Middle East. Question: In your opinion, is the Church permitted to participate in politics? Metropolitan Hilarion: The Church does not participate in politics directly, in the sense that it does not create its own political parties and does not support any one political party over another. It does not associate itself with one or another wing of the political spectrum, or with one or another political view. The Church has no preference with regard to political structure. The Church has lived under different political regimes. Our parishioners are also people of the most various political orientations. But the Church reserves the right to evaluate from a moral and spiritual position various policies, statements, and programs; such assessment is often done as the Church on an official level, as well as by its individual representatives. Question: Does this assessment influence public opinion? Metropolitan Hilarion: I think that it influences people who listen to the voice of the Church. This is not all of society, but it is a significant part of society. The Church has great authority in society, but there are people – and this is characteristic of contemporary democratic society – who are not fond of the Church, who are irritated by it in some way, who do not agree with it. Question: During the last presidential elections, people criticized the Church: the Patriarch called upon people to vote for a given candidate. Are such conclusions justified? Metropolitan Hilarion: I think not, because there were no direct appeals to vote. The Patriarch, in a meeting with the presidential candidate Vladimir Putin and leaders of religious confessions, appealed to him as the most likely to win the elections. Moreover, the religious leaders who met with the then-Prime Minister knew him well, and knew the other candidates. In the room in which this gathering took place there was absolute unanimity. 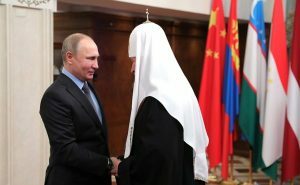 All leaders of traditional religious confessions supported Vladimir Putin, expressing gratitude for what he had done for the religious revival in the country. We had the choice of several candidates, but only one of them was a practicing Orthodox Christian. And this, of course, was a very important indicator for us. Question: At the end of the 1980s there was a whole series of clergymen who were deputies in the parliament of the USSR. 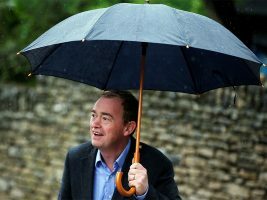 Why are clergy now prohibited from running for parliament? Metropolitan Hilarion: Then the Soviet Union was ceasing to exist and political changes were beginning. Representatives of the Church began to be invited to elected bodies. At first, the Church responded to this. Metropolitan Alexy, the future Patriarch, was a member of the Supreme Soviet of the USSR and a series of hierarchs participated in the work of elected bodies. But at a certain point it became clear that this work was impermissible for clergy, because one way or another they had to associate themselves with a given wing of the political spectrum. They were enlisted directly in resolving political problems. Moreover, this provoked clergy to participate in various parties that were opposed to one another. The Church saw how many risks were involved with this work and how little it corresponded to its self-understanding. The Holy Synod adopted a decision to refuse participation in political life. True, a proviso was recently added to this decision: in exceptional cases, with the blessing of the hierarchy, such participation can be acceptable. This proviso is connected with the fact that today in a number of countries, for instance in Ukraine, there are schismatic communities (they call themselves priests or bishops) that are not forbidden from taking part in elections. In a situation in which, for instance, a schismatic clergyman is running for a given elected body, the Church can give its blessing to a canonical clergyman to participate in the election to this body. Question: Certain representatives of traditional religions assert that not all religions are equal in our country. In particular, they assert that the Russian Orthodox Church receives preferential treatment: for instance, it is allocated land for building churches and has property transferred to it – while at the same time their faithful are forced to gather in the streets because of a lack of churches. Can you comment on this? Metropolitan Hilarion: Since inter-confessional relations on the territory of the Russian Federation are not included within the scope of my direct responsibility, I have not studied this question in sufficient detail. I can only say that Russia is a very large state in which there are many territorial entities, each of which has its own situation. We have regions in which the majority of the population does not belong to the Orthodox Church, but rather to some other traditional religion. And there, on the contrary, the government is criticized for showing preferential treatment to the religion to which the majority of the region’s population belongs. Question: Recently a number of deputies suggested expressing the special role of Orthodoxy in the Constitution. In your view, should the Russian Orthodox Church be privileged over representatives of other religions of the Russian Federation? Metropolitan Hilarion: I do not think that we should seek out any privileges or preferences in terms of law or social status. I suggest that the Church should occupy whatever place it deserves in society. The role that the Church has played in the formation and establishment of the Russian state, society, and those nationalities that today make up the one Russian people should be recognized. Question: Does the Russian government seek the help of the Russian Orthodox Church in the resolution of international problems? If so, which problems? Metropolitan Hilarion: We cooperate very closely with the Ministry of Foreign Affairs of the Russian Federation. In particular, a working group has been created that meets twice a year. Besides this, we interact almost daily with the Foreign Ministry in many spheres. Here it needs to be said that the Church has never been – including in international politics – the conductor of any of the Russian government’s ideas. The Church has its own agenda and interests in the international sphere. But often these interests wholly or partially overlap with those of the state. As an example, I can site the position of the Russian government and the Russian Orthodox Church with regards to Syria and the Middle East as a whole. For us, the main topic today is the defense of Christians living in the Middle East. We sympathize with everyone who suffers as the result of armed conflicts. When, for example, the Imperial Orthodox Palestinian Society, with the blessing of the Church, gathers humanitarian aid and then delivers it to Syria with the help of the Ministry of Emergency Situations, this material help is distributed not only among Christians, but also among the entire population of Syria. Question: But does the government help in resolving problems of the Church? For instance, before the President of the Russian Federation’s recent visit to Italy, there were reports in the western media that, following Putin’s visit to Pope Francis, there would follow a meeting between the Patriarch and the Pope. Is this the case? 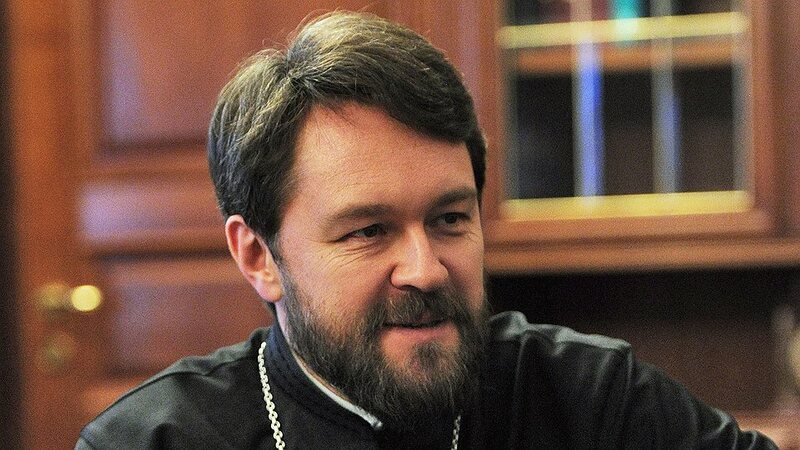 Metropolitan Hilarion: This is quite possible, but these two meetings are not connected with each another. After all, we have been talking about the Patriarch meeting the Pope for many years already. But we do talk about the fact that this meeting needs to be prepared for well. And we are preparing it, meeting with the leadership of the Roman Catholic Church. For example, I have met with Pope John Paul II, Pope Benedict XVI, and twice this year already with Pope Francis. For us, a meeting of the Pope and Patriarch is not an end in itself. For us, it is one stage of development in bilateral relations. We will be ready to organize such a meeting when we feel that conditions have ripened for it. That is, when the primary obstacles in the relations of the Churches have been removed. The President of the Russian Federation met with the Pope as the head of one state meeting with the head of another state. The President did not have any special message from the Patriarch addressed to the Pope. There was no intention of preparing or hastening such a meeting. I think there will be a meeting between the Patriarch and the Pope, but we will prepare for it exclusively in the format of bilateral relations with the Roman Catholic Church. Question: You recently told the French media that you are already preparing a meeting of the Patriarch with the Pope. Metropolitan Hilarion: And I state this to you as well: that we have been preparing for it for many years already. Question: And how are you preparing for it? Metropolitan Hilarion: We are preparing for it by negotiations with the Roman Catholic Church on those questions that we believe should be on the agenda for such a meeting. But I repeat once again that, for us, the meeting is not an end in itself; for us, the questions themselves are important. So, for example, I told Pope Francis at our last meeting that the situation of Christians in the Middle East is a topic that requires quite special and extraordinary efforts on the part of our Churches. We need to stand up in defense of Christians. One must state that the Roman Catholic Church and the Russian Orthodox Church are doing a great deal for the defense of Christians. But we can combine our efforts, doubling the energy and achieving greater results. Question: Did the Pope agree with you? Question: Have relations between the Russian Orthodox Church and Rome changed since Francis I ascended to the Papal throne? Metropolitan Hilarion: They changed a great deal for the better after the ascension of Pope Benedict XVI to the throne. He was able to remove the tension that had existed under the previous pontificate. He related with great sensitivity to the problems of Orthodox-Catholic relations; under him, our relations took on a positive and progressive character. And I think that, if he had not gone into retirement, then perhaps the Patriarch would have met with him. But now, of course, we are not talking about missed opportunities, but rather about the possibility of a meeting of the Patriarch with Pope Francis. We see that Pope Francis regards the Orthodox Church very kindly, which became evident while he was still a cardinal. Question: What problems impede a meeting of the Pope with the Patriarch? Metropolitan Hilarion: The main problem that remains in our bilateral relations is the situation in Western Ukraine, relations between the Orthodox and Greek Catholics. These relations soured at the end of the 1980s, when Greek Catholics seized Orthodox churches. I do not want to get into the history now: views of history always differ between conflicting parties. But the conflict has not been overcome: in Western Ukraine there are many places where the Orthodox, as before, have been deprived of their churches, as we regularly remind our partners in the Roman Catholic Church. True, in recent times we have had some good news from Western Ukraine. Hope has appeared that the Diocese of Lviv of the Ukrainian Orthodox Church of the Moscow Patriarchate will receive land and a building for the creation of a religious center. This is something that we had been unable to accomplish for many years. If this event takes place, it will undoubtedly have an effect on the speed of preparations for the meeting. Question: If I have understood you correctly, you are not preparing this meeting as a ceremonial event, but are approaching this meeting by your consultations and resolution of these problems? Question: In your opinion, when can a meeting of the Patriarch with the Pope take place? Metropolitan Hilarion: I am not prepared to say either when or where a meeting will take place, because we have not yet discussed this question. I can only say that it will take place when both sides will be ready for it. 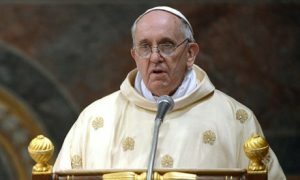 Question: The Moscow Patriarchate has repeated stated that a meeting of the Patriarch with the Pope cannot take place, in part, because Catholics on the territory of the Russian Federation engage in proselytism, that is, in enticing the Orthodox into Catholicism – although the Catholics themselves categorically deny this. But what is it about Catholic proselytism in the Russian Federation, when the Russian Orthodox Church itself engages in proselytism on non-canonical territory? Metropolitan Hilarion: I should explain by what we mean by proselytism and how it differs from mission. By mission we mean missionary work either among our own faithful or among our potential faithful. That is, those who by their roots belong to our tradition, those who do not belong to other Christian Churches. If we are talking about other Christian Churches with whom we have relations on the level of our relations with the Roman Catholic Church, then targeted missionary activity with the aim of separating individual members from it is proselytism. Therefore, with the Roman Catholic Church we have had for several decades a tacit ban on proselytism. At the official level, both Orthodox and Catholics recognize this, just as at the official level it is recognized that Unia is not a method of achieving unity. Catholic proselytism on Russian territory was a very pressing issue in the beginning of the 1990s. We founded a working group with Russian Catholics to address difficult questions in mutual relations, which was later transformed into a working group on collaboration and cooperation; this group examined specific cases that could be interpreted as proselytism. Therefore, this topic has today largely been removed. We do not engage in proselytism on the canonical territory of other Churches, and expect that other Churches not engage in proselytism on our canonical territory. Question: In an interview with Kommersant, Archbishop Paolo Pezzi, head of the Catholic Archdiocese of the Mother of God in Moscow, stated: “during the first millennium of the history of Christianity, all local Churches recognized the primacy of the Bishop of Rome. The Catholic Church invites everyone to a deeper reflection on the nature of primacy in the Church and the role of the Bishop of Rome.” Is the Russian Orthodox Church prepared for such reflection: that is, to recognize the primacy of the Pope over itself? Metropolitan Hilarion: Here I should explain that the title “first bishop” does not mean his supremacy over other bishops. We recognize that in the first millennium, the first in the diptychs – that is, the first on the Church’s official list – was the Bishop of Rome. And this primacy has never been challenged by anyone. But the whole question is how to interpret this primacy. We consider it to be a primacy of honor, that is, that the Pope of Rome was one of the five of the then Patriarchs: after him in the diptychs came the Patriarchs of Constantinople, Alexandria, Antioch, and Jerusalem. Each had his own ecclesial jurisdiction. The Pope of Rome, in our eyes, was the Patriarch of the Western Church, while in the East there were four Patriarchs, each one of whom had his own canonical territory. After the rupture of communion between Rome and Constantinople, this primacy within the family of the Orthodox Churches in fact transferred to the Patriarch of Constantinople; today, in our family of Orthodox Churches, it is the first among equals. But, again, this is not the power of the Patriarch of Constantinople over other Patriarchs. It is a primacy of honor. It is expressed in the fact that, when the Patriarchs gather, the Patriarch of Constantinople presides at the Liturgy. If he is absent, the primacy falls to the Patriarch of Alexandria, and so on. If today we had a united Church with Rome, then the first would be the Pope of Rome, but at the same time we would not recognize him as the head of the Universal Church, nor would we consider the other Patriarchs as his subordinates; we would recognize him as the head of the Local Roman Church, and the other Patriarchs as equal in rank, but as being below him in the diptychs – that is, in honor.